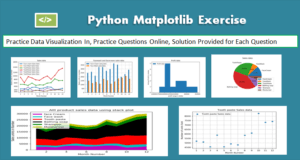 This Matplotlib exercise project is to help Python developer to learn and practice Data data visualization using Matplotlib by solving multiple questions and problems. 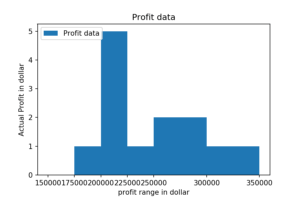 Matplotlib is a Python 2D plotting library which produces high-quality charts and figures and which helps us visualize large data for better understanding. 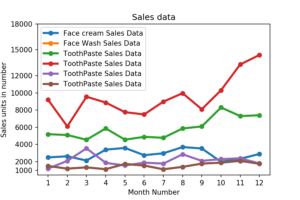 Pandas is a handy and useful data-structure tool for analyzing large and complex data. 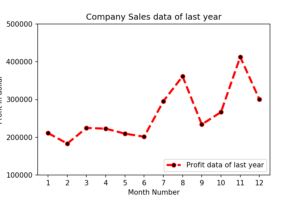 For this exercise, we are using Pandas and Matplotlib to visualize Company Sales Data. Use following CSV file for this exercise. 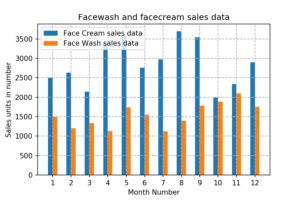 Read this file using Pandas or numpy or using in-built matplotlib function. 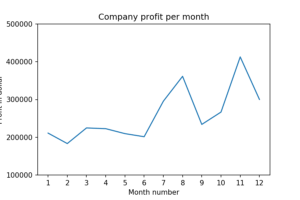 What included in this Matplotlib Exercise? This exercise contains ten questions. The solution provided for each issue. 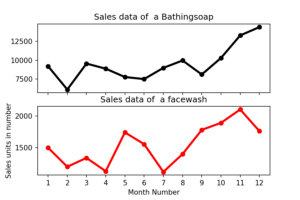 Each question includes a specific Matplotlib topic you need to learn, When you complete each issue you get more familiar with Data data visualization using matplotlib. The line plot graph should look like this. Show legend at the lower right location. 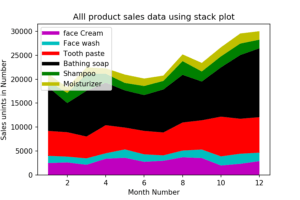 Display the number of units sold per month for each product using multiline plots. (i.e., Separate Plotline for each product for each product). The graph should look like this. Also, add a grid in the plot. grid line style should “–“. The scatter plot should look like this. 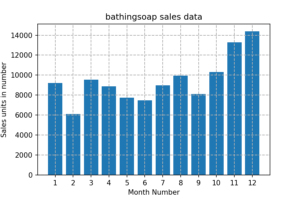 Bar chart should display the number of units sold per month for each product. 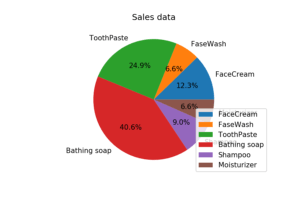 Add a separate bar for each product in the same chart. The bar chart should look like this. 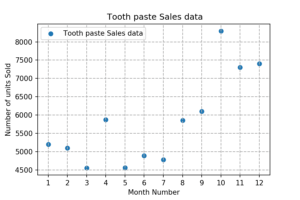 The histogram should look like this. Note: In Pie chart display Number of units sold per year for each product in percentage. The Pie chart should look like this. The Subplot should look like this. The Stack plot should look like this.